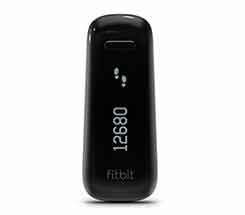 Fitbit one Wireless Activity.Fitness means being active, sleeping well, and eating smarter and the Fitbit one helps you do all three. How the Fitbit Works: You have a few choices on where to wear the Fitbit (typically waist, pocket, chest pocket or bra), and you keep that Fitbit on you for 24 hours. Whereas the Ultra had a built-in clip, this one has to use the included silicone clip. The upside of this is that the silicone is unlikely to crack, which is something several owners of the Ultra complained about. The downside is that the Fitbit could possibly come out of the silicone case if the case were to get pulled on clothing or some other object. Whereas you used to be able to buy a lanyard to secure your Ultra, in the case of the One, you would only be securing the silicone case and your Fitbit would be lost. Time will only tell whether the silicone case idea is an actual improvement over the Ultra’s design. On receiving your Fitbit, there’s a booklet says to charge your Fitbit for 5 minutes. The charge is supposed to last for about a week. When the Fitbit battery is completely depleted, charging is to take approximately two hours. If you’re like me, you’ll find yourself just popping the Fitbit into its charger whenever you know you’ll be sitting at the computer a while. Unlike the Ultra, which used one USB port on your computer, this Fitbit will use two: One is a small piece that communicates wirelessly with your Fitbit. The other is what I believe people are referring to as a “dongle” — it’s a USB with a short cord: You snap your Fitbit into the end, and that’s how the Fitbit charges.